Fire up your vaporizers, bring out your bongs, unwrap your edibles, and take a deep inhale of the dankest entertainment goodness to ever grace your screen. High Maintenance is back today, with three new installments delivered directly to your door. Er, computer. If you haven't yet seen the greatest show not on television, High Maintenance is the story of a pot dealer —the "guy"—summoned by text to bring herbal joy to all the good girls and boys. He arrives on bike about 45 minutes later (give or take) and is invited into the homes of his clients to make his deliveries, thus stumbling into the middle of these bizarre and beautiful little vignettes of New York life. 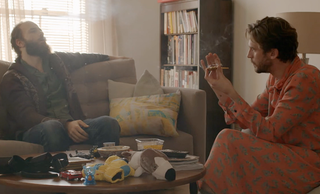 But this isn't stoner comedy; it's probably one of the most authentic representations of urban life circa 2014. Welcome to Movie Night, where Gizmodo staffers tell you what you should be streaming tonight.